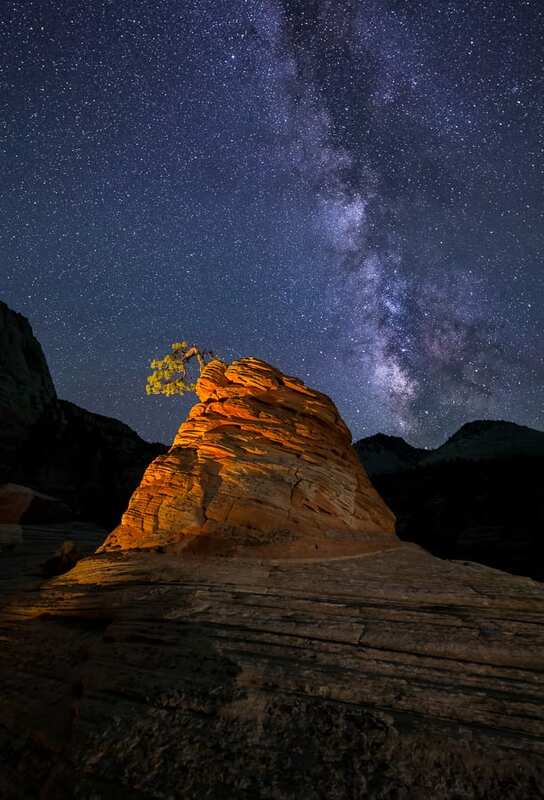 Zion National Park boasts some of the most spectacular scenery in the Southwest and is a mecca for landscape photography. Experience the towering walls of The Narrows, peer over gigantic vistas, feel the spray of waterfalls, gasp at brilliant fall color, or enjoy intimate forest scenes. There are also many opportunities to photograph wildlife like bighorn sheep, mule deer, and turkeys. Small group size capped at 5 people to ensure personalized photography instruction and individual attention. Zion trips can either be scheduled for either sunrise or sunset. Night photography can be arranged upon special request. We have many spots where not many people go so we can avoid the crowds. Drive Time: Around 60-90 mins each way. Tour Meetup Location: You will meet at our office in Kanab, UT. The address will be given in your confirmation email. This is a safe place to park your vehicle. You can leave any valuables indoors. Once you arrive, we’ll ask you to load your gear and sign a liability release waiver. Contact us if you are unable to get to the meet-up spot and we’ll make alternate arrangements. Las Vegas is the closest major airport to Kanab. There is no public transportation to Kanab, so you’ll need your own rental car or private vehicle. We recommend that you stay in a hotel in Kanab the evening of your tour. There are many good hotels in the area like Hampton Inn, Holiday Inn Express, Comfort Inn & Suites, and the Canyons Botique. 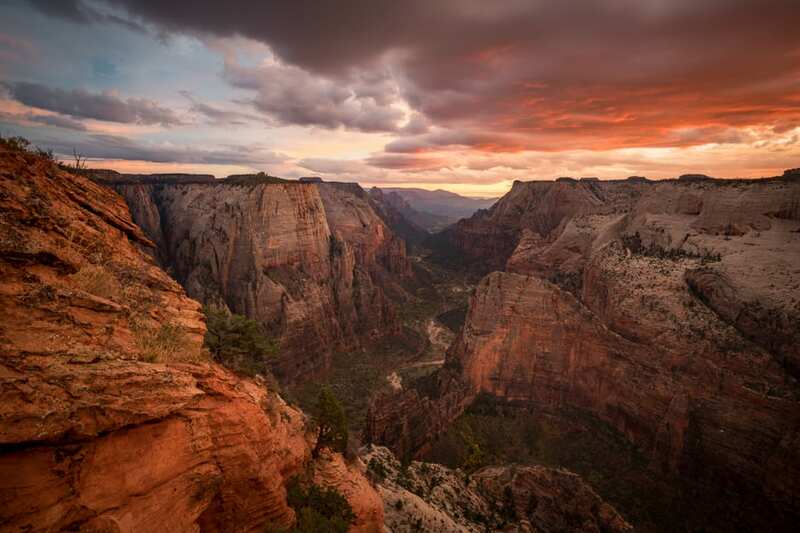 Permits: We hold commercial use permits for Zion National Park. Tour Meetup in Springdale: We often get requests to pick-up folks in Springdale, just outside the National Park. If you want us to pick you up here, PLEASE CONTACT US AHEAD OF TIME TO MAKE ARRANGEMENTS. Note that the tour time will be 2 hours less since we won’t have the 60min drive time to/from Kanab. 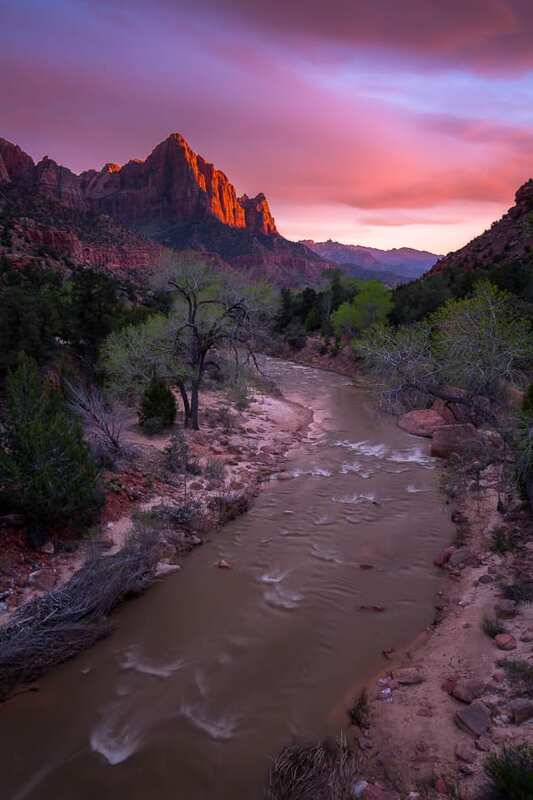 Weather Conditions: Zion National Park is impressive in all seasons and is often at it's best during inclement weather. There is a lot of topographical variation so the temperature can vary considerably from the bottom of the canyon to the top of the rim. We cannot offer refunds due to weather unless we cannot go out at all. Zion is a great destination when it’s raining. The crowds thin out, the waterfalls start flowing, and the foliage turns deep green. Note that we cannot offer refunds due to weather unless we cannot go out at all. Just make sure you dress and prepare adequately for the weather. Hiking / Fitness: Zion trips can be tailored to the fitness levels of the group. If you’re up to it, we’ll take you on some long, strenuous hikes with amazing views. We can also do a driving tour with just short walks to photo spots. Most of our tours will end up somewhere between the two extremes. If you want to do the Narrows or another hike through water, we recommend either using your own waders or renting wading gear from an outfitter in Springdale (canyon shoes, neoprene socks, dry pants). During the colder months of the year, you will need cold water protection when hiking in the Narrows. Please let us know ahead of time if you want to do a water hike. Trip Itinerary: The exact tour itinerary is flexible based on current conditions, fitness levels of the group, and what the group is interested in. We will take you to many of the best spots for evening light, both in and around the National Park. Note that we do not serve the Kolob Canyons section of the park. Food/Water: We do not provide food on our outings. All participants should bring food/water to hold them through the tour. Many folks will eat during the drive to/from Kanab. We will have a cooler where you can store food and drink. Night Photography: Occasionally we get requests to stay out later for night photography. If this is something the group wants to do, we can stay around 2.5 hrs after sunset to capture the stars. The cost of this add-on is $99/person. We will only do this extension if skies are clear and everyone in the group agrees to it. We will teach you about low-level lighting and using natural light for foreground enhancement. What to Wear: You should check the weather forecast prior to coming on the trip. If it’s going to be hot, wear light-colored clothing and a hat. If the temperatures are cold, bring some warm layers and long pants. Don’t forget sunglasses and sunscreen. Even when it’s warm outside, the temperature can drop quickly after the sun sets. You may wish to bring a light jacket for the evening. If it’s very cold and or windy, don’t forget a warm hat and some gloves. If rain or snow is in the forecast, bring a rain jacket. 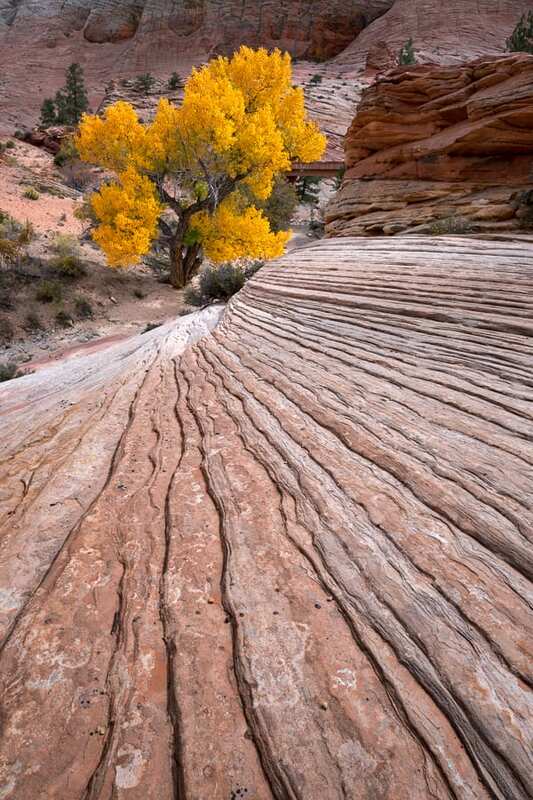 We recommend wearing sturdy footwear in Zion National Park due to uneven terrain and sand. Cell Phones: Bring your cell phone along! They are great for capturing candid images. Plus, most folks will have cell service when near Springdale. There are USB ports in our vehicles so bring a charging cable if you need one. 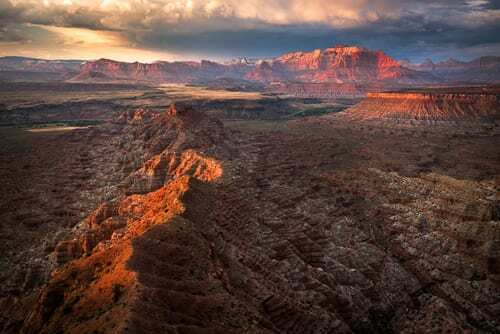 Camera Gear: A wide angle zoom lens is useful in the canyons and slickrock areas (equivalent 16-35 on a full-frame camera or 10-22mm on a crop sensor). A mid-range lens in the range of 30-100mm will provide nice scale and compression. Telephoto lenses will be useful for the wildlife opportunities we encounter. Bring as many lenses as you like - just ensure your pack isn’t too heavy. For filters, a circular polarizer can come in handy for removing the glare from the water. A neutral density filter can be nice to smooth out rough water or create long exposures for fast moving clouds. Don’t forget extra batteries, memory cards, and cleaning supplies. Please contact us if you’d like to rent any camera gear for your outing. Tripods: Under current regulations, tripods cannot be used by commercial groups in the Narrows. Only monopods are allowed. We are working closely with the park to hopefully get this changed in 2019.